Oldham Councillor for Coldhurst, Montaz Ali Azad, has been disqualified as a director after an investigation found he had allowed his laundry company to employ three illegal workers. 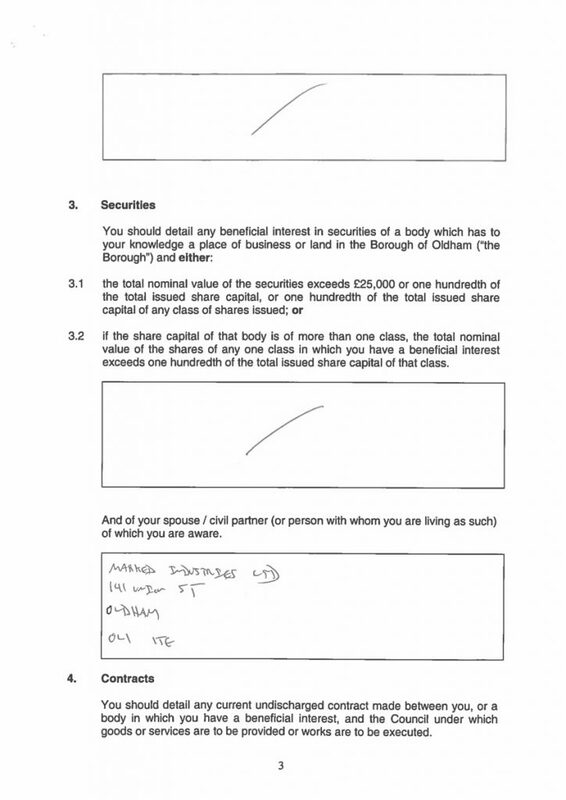 His official declaration of interests at Oldham Council shows that his spouse continues to operate a laundry business on Union Street in Oldham. “Mr Montaz Ali Azad, who ran Eurolinen UK Ltd which traded as an industrial laundry in Greater Manchester has been disqualified from acting as a director for six years for allowing the company to employ three illegal workers. The disqualification followed an investigation by the Insolvency Service, working with the Home Office. Mr Azad signed a disqualification undertaking, which was accepted by the Secretary of State on 17 August 2016, which bans him from being a company director and from being involved in the management of a limited company in any way for a period of six years from 7 September 2016. The disqualification bans him from being a company director and from being involved in the management of a limited company in any way for the duration of the ban. Eurolinen UK Ltd went into liquidation on 18 September 2014 owing £105,367 to creditors. Mr Azad failed to ensure that Eurolinen UK Ltd complied with its statutory obligations under immigration laws, resulting in the employment of 3 illegal workers. This breach was discovered following a visit from Home Office Immigration Officers on 27 September 2013 and resulted in a civil penalty of £15,000 being issued by the Home Office which remained unpaid at the date of liquidation. Mr Azad also failed to ensure that the company correctly operated a Pay As You Earn Scheme, by failing to declare these employees to HMRC and accounting to HMRC for any deductions made from their wages. The Insolvency Service rigorously pursues directors who break employment and immigration laws. Taking on staff illegally means those staff do not enjoy basic employment rights and is a clear breach of a director’s duties. The public has a right to expect that those who break the law will face the consequences. Running a limited company means you have statutory obligations as well as protections, and this should serve as a warning to other directors tempted to take on illegal staff. Eurolinen UK Limited (CRO 05372138) was incorporated on 22 February 2005 and started trading straight away as an industrial laundry from premises at Unit 2 Plantation Industrial Estate, Whitelands Road, Ashton-under-Lyne. Mr Azad’s date of birth is 07 August 1963 and he resides in Oldham in Greater Manchester. Mr Azad was the sole director from 01 March 2005 until the company went into liquidation. The Company ceased trading in August 2014 and went into liquidation on 18 September 2014 with an estimated deficiency of £105,367. On 17 August 2016, the Secretary of State accepted a Disqualification Undertaking from Mr Azad, effective from 07 September 2016, for a period of six years. Following the visit to Eurolinen’s trading premises, Home Office Immigration Enforcement (“HOIE”) issued Eurolinen with a civil penalty of £15,000 in respect of Eurolinen’s employment of illegal workers, due to be paid by 09 January 2014. Eurolinen did not raise any objections or appeals against this civil penalty, nor did it make any payments to HOIE. Eurolinen entered into liquidation on 18 September 2014, with a deficiency as regards creditors in the sum of £105,367, of which £15,000 is due to HOIE. In addition, Mr Azad failed to ensure that Eurolinen correctly operated a Pay As You Earn Scheme, by failing to declare these employees to HMRC and accounting to HMRC for any deductions made from their wages.